The point is that sports color commenators treat essentially random day-to-day fluctuations as indicators of trends — because they have lots of time to fill and not a lot of substance to fill it with (play-by-play coverage is something else), and because like all of us they are narratophiles (lovers of story) and seek to find a coherent narrative in pretty much anything that happens. Meanwhile, color commentators can fall back on all that accumulated data, to wield fan statistics as another time-filler. 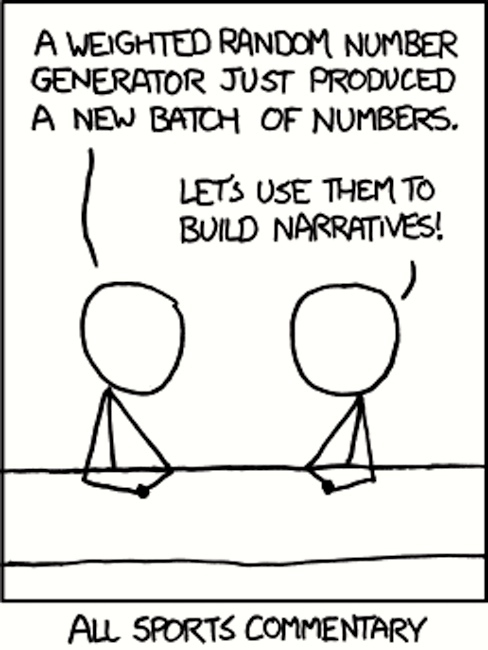 The mathematical point is clarified on the explain xkcd site for this cartoon. Tops in errors in prime numbered innings committed by left-handed shortstops with less than five years in the majors. And on narratophilia — the love of, desire for, (satisfying) stories — on this blog, postings here and here, with reference to etymythology, though the idea clearly has wider application. Then there’s the sports color commentary as a type of discourse, a genre, a large-scale discourse routine, involving conventions of both form and content. Finally, routines, special types of discourse structures, for instance: “verse forms, secret languages, riddles, proverbs, and larger genres, both conversational and literary”. One of those larger discourse genres is the sports color commentary, setting a particular sports event in context through narratives, recitations of statistics, brief interviews with sports figures, evaluations of play, personal information about sports figures, and the like, each with its own organizing principles. Genre (from French genre, meaning ‘kind, sort’) is any form or type of communication in any mode (written, spoken, digital, artistic, etc.) with socially-agreed upon conventions developed over time. Genre is most popularly known as a category of literature, music, or other forms of art or entertainment, whether written or spoken, audio or visual, based on some set of stylistic criteria, yet genres can be aesthetic, rhetorical, communicative, or functional. Genres form by conventions that change over time as cultures invent new genres and discontinue the use of old ones. Often, works fit into multiple genres by way of borrowing and recombining these conventions. Stand-alone texts, works, or pieces of communication may have individual styles, but genres are amalgams of these texts based on agreed-upon or socially inferred conventions. Some genres may have rigid, strictly adhered-to guidelines, while others may show great flexibility. This entry was posted on December 20, 2018 at 7:04 pm and is filed under Discourse organization, Linguistics in the comics, Stories, Style and register. You can follow any responses to this entry through the RSS 2.0 feed. You can leave a response, or trackback from your own site.